Just imagine your own sports bar where all the Fightin' Fish fans hang out and discuss the new catcher, Jorge Alfaro, as well as who will become this season's veteran closer — Adam Conley or Drew Steckenrider. 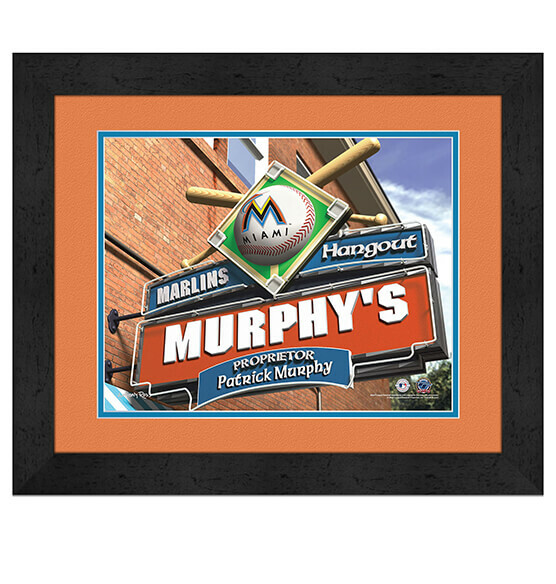 No suds (and Marlins) fan should be without our Miami Marlins Personalized MLB Pub Sign Framed Print for their fan zone! Whether you buy this print for yourself or as a gift, this generously sized MDF vinyl-wrapped frame, glass and paper Marlins sports decor will be a great-looking addition to the home or office. Just let us know the names you want printed on the marquee and your custom pub sign will arrive at your door, ready to hang.